Railpictures.ca - A.W. 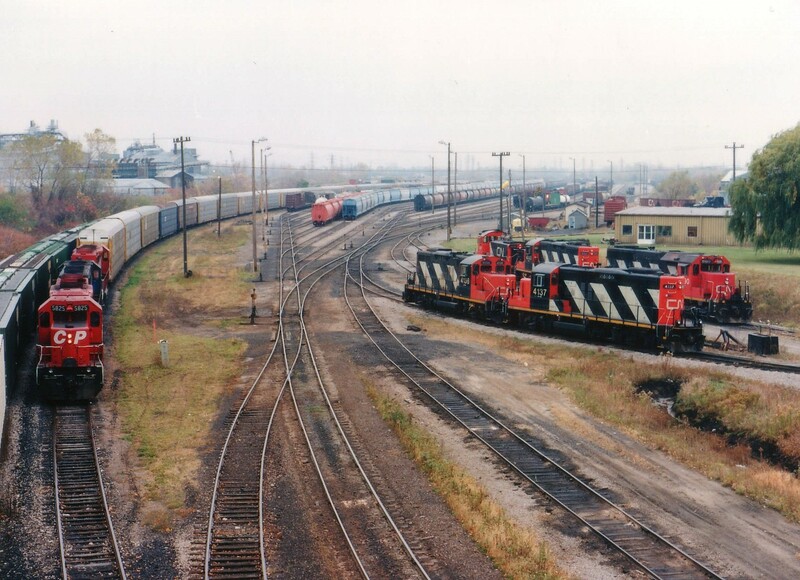 Mooney Photo: Perhaps a bit of confusion on my headings due to the fact this is a CN area image, but a couple of CP detour trains are passing E and W on the CN Grimsby Sub. At the time of this photo, the CP line thru Hamilton to Fort Erie was shut down due to reconstruction at the Hunter St. tunnel. CP in this case used the Grimsby sub route to cross over to the USA rather than coming up thru Clifton Hill tourist area as they had been. This image, if taken today from this Victoria Av overpass location, would be shocking to say the least. The Cyanamid Plant (extreme left) is gone, as is all the yard trackage, it is just a dead wasteland with nothing to see but the CN mainline and I believe that metal yard office building. The CP trains, #521 and #522 (approaching) with CP 5825, HATX 514 and CP 5862 I remember had Gordie Rivers as engineer. Understand he has long since retired. Wondering if he follows this RP group…… | Railpictures.ca – Canadian Railway Photography – photographie ferroviaire Canadienne. Love looking at other photos from back then. The ‘Falls’ was always full of excitement of sort back then, George. Thanks for looking thru the photos. Use to take the train to Niagara Falls to get away from Bayview. Wasn’t the Falls great back then. Nice! I am enjoying so many of your shots here. Very glad you did document the Niagara area! I am glad you are enjoying these Niagara views, Paul. I think back in memory that the main reason I spent so much time in Niagara was because everyone else was at Bayview Jct in those days. So I thought, “Why document what everyone else is documenting”?? I could never have imagined how much of a railroad ghost town Niagara was to become. Amazing to see what was here in Niagara twenty plus years ago. Great shot here! As you say, it sure is a different look today in the same area. Entered it into the Time Machine. Just awesome! Loving these falls area shots! Yeah but with GO it’s usually just the same thing :/ I wanna see some interesting down here. Even foreign powers gotten old. There is always the possibility of reroutes over the Grimsby. Work at the Hamilton CP tunnel; or perhaps a shift in the International Br supports (they were shored up some years back) or even some major reconstruction could result in detours. I understand the next situation though, will be work on CN Bridge 6 at the Canal, resulting in CN detouring over CP. Just a rumour circulating at present, but you just never know. We will have GO entertaining us eventually as well. Now…do you ever think this would happen again? What if they were doing repairs on the International bridge, would they reroute CP and *possibly* NS over the Grimbs Sub? jstars: I watched one 8 minute video to start and I have to say, as I do to so many modelers, that I just can’t get over the attention you guys pay to detail. Amazing!!! And it looks like you have lots of room to work, too. Even the #328 running light power had that NW caboose on; just as I recall seeing. And I’ve seen that power lashup too. Great stuff. I’ve been a lurker for a long time and have seen all of your pictures including the ones on Niagara Rails. My biggest regret was from about 1998 onward when my brother and I used to ride out bikes down to Clifton, NF yard, Firemans park and never considered taking pictures. Your photographs mirror the memories I have from that time. Your pictures have helped me shape my model railroad to recreate the late 90′s on Stamford and Grimsby Sub. Ahh man, I remember visiting this yard quite often as a child. Great photo as always, Mr Mooney. I also love the CP Detour train photos…do you have any more of them? Thanks for the kind comments. I’m sure you will find some interesting photos I’ve posted in past years on this site…..just click on my name in bold to bring up all the 400+ some images. There are a bunch from Niagara mixed in there somewhere. I was always fascinated by the fact there was so much going on down in Niagara yet very few fans took the time to record it all. And now, its gone. As well, never realized how many Niagara region fans there were out there until I began posting on RP.ca. Thanks again. Arnold, I made an account just to thank you for posting these wonderful pictures, particularly of the Niagara Region. I was 8 years old that evening and likely trick or treating a couple miles away between Portage Road and Dorchester. Look forward to the next post!